JD is a leading retailer and cloud service provider in China. There is a wealth of information in its catalog of product images, which could form the foundation for visual search or price comparison applications, if it could be analyzed. When JD tried to use GPUs to analyze its huge database of merchandise images, it found them hard to manage, and found the process of copying data between the storage and data clusters time consuming. 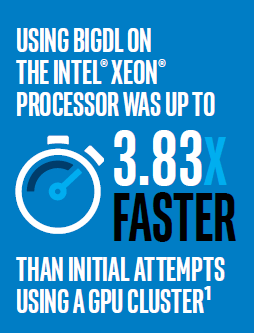 Working closely with Intel, JD deployed the BigDL deep learning library on the Intel® Xeon® processor-based servers that store the images, and delivered an up to 3.83x performance increase1. This gives JD greater agility in using its product images as the foundation for new services. For JD, the cloud is the foundation of its business. As well as being a leading retailer in China and providing a platform for others to sell online, the company has a public cloud offering. In some cases, the retail side of the business drives innovations, which can then be offered to public cloud customers. With a huge catalog of products on sale in its retail site, the company has hundreds of millions of product images. These are stored in Apache HBase*, the distributed, big data store of the Hadoop framework. JD wanted to be able to match features in different product images. This capability could be used, for example, to enable a visual search feature, where customers could snap a photo of something they like, and JD could find something similar they can buy. Alternatively, it could be used to match its products with those on other websites, so that JD can price its products competitively. The team at JD had tried to build the feature matching application using graphics processing units (GPUs), but had found it difficult to scale GPUs adequately to handle the database. JD had tried using both multi-GPU servers, and a GPU cluster. In the cluster setting, JD had encountered frequent out of memory errors and program crashes due to insufficient GPU memory. The resource management and allocation of individual GPU cards in the cluster proved to be complex and error-prone. For multi-GPU servers, JD’s developers had to manually manage data partitioning, task balancing, and fault tolerance. There were also a lot of dependencies, such as CUDA*, which made production deployment difficult. With the image processing carried out in GPUs, there was also latency resulting from the time taken to copy the data from HBase to the GPUs for analysis, and to copy the results back again. This part of the process was responsible for about half of the total time taken for feature extraction. Image preprocessing was also challenging because there are no software frameworks to support resource management, data processing and fault tolerance. JD needed an infrastructure that would support the feature extraction pipeline for its database of images, in a way that would be scalable and sustainable. JD used BigDL, a distributed deep learning library for Apache Spark*, to enable the feature extraction workload on CPUs, using servers based on the Intel® Xeon® processor E5-2650 v4. BigDL enables Scala or Python* to be used to create deep learning applications that are based on scalable Spark clusters. It can be scaled out to hundreds or thousands of servers. To enhance its performance, BigDL uses the Intel® Math Kernel Library (Intel® MKL) and parallel computing to take advantage of the capabilities of the Intel Xeon processor. BigDL enabled JD to take the Caffe* model it had previously trained using its GPU estate, and redeploy it on its existing CPU architecture, where the images were stored. In JD’s application, the Single Shot MultiBox Detector (SSD) model is used to detect objects in the images, and the DeepBit model is then used to extract features from the objects. 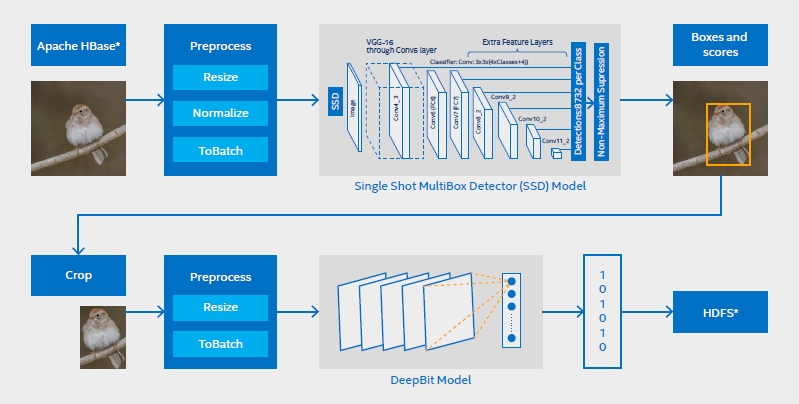 Figure 1 – The workflow for feature extraction at JD, using BigDL to manage the SSD model for object detection, and the DeepBit model for feature extraction. Read hundreds of millions of pictures from HBase as resilient distributed datasets (RDD). Use BigDL to preprocess these images to prepare them for the SSD model (including resizing, normalization, and batching). BigDL provides an image preprocessing library based on OpenCV, which supports common transformations and augmentations. Load the Single Shot MultiBox Detector (SSD) model for large scale, distributed object detection on Spark. This generates the coordinates and confidence scores for the detected objects. Crop the original picture based on the coordinates of the object with the highest score. Preprocess the target images in preparation for the DeepBit model (including resizing and batching). Use BigDL to load the DeepBit model for distributed feature extraction of the target images on Spark. This generates the corresponding features as vector floats. Store the RDD of the extracted object features in the Hadoop Distributed File System* (HDFS*). Using a highly parallel architecture with 1,200 logical cores, the process of reading the image data from the database was greatly accelerated, contributing to an overall performance increase of 3.83x1. The solution is based on JD’s existing CPU estate. It uses the Intel Xeon processor E5-2650 v4, running at 2.20GHz. Each server has 24 physical cores with Intel® Hyper-Threading Technology (Intel® HT) enabled, and is configured to support 50 logical cores using Apache Hadoop Yet Another Resource Negotiator* (YARN*), a cluster management technology. Using 24 servers, the solution has a total of 1,200 logical cores, offering a highly parallel workflow. By using BigDL, JD was able to reuse the model it had previously trained using GPUs, on its existing servers based on the Intel Xeon processor. This lowered costs, compared to running a separate GPU cluster for feature extraction, because there is no need for additional GPU cards and the GPU servers are otherwise the same configuration as the CPU servers. Additionally, the CPU cluster processes the BigDL workload overnight, and is available to use on other tasks during the day, increasing utilization. The highly parallel data loading significantly cut the time taken for feature extraction, and JD benefited from the use of the Spark framework to manage resources, fault tolerance and task balancing. With the increased performance, and the ability to easily scale out the solution by adding additional standard servers, JD can now handle larger data sets in its image analysis. The new feature extraction capability was developed in collaboration with research and development engineers from Intel. JD and Intel have a long-standing relationship, which in previous years has focused on developing big data and analytics applications. Intel’s R&D team in China assists cloud service providers with enabling open source solutions, such as BigDL, and is able to bring the experience of working on many previous deployments. JD has established a platform that it can use to create new services based on image matching and feature extraction, and that it can use as a template as it develops other deep learning and artificial intelligence applications. The BigDL framework enables JD to use pretrained models from frameworks such as Caffe*, Torch* and TensorFlow* on general purpose hardware, enabling JD to test and launch new services more quickly and without investment in dedicated hardware. JD continues to apply BigDL to a wide range of deep learning applications, including distributed model training, for both internal applications and for cloud-based services. In its public cloud offering, JD has already launched a text classification model based on BigDL, which classifies articles by topic. JD continues to work closely with Intel on these and other new technology initiatives. JD is part of Jingdong Group, which began its work in ecommerce in 2004. As of March 2017, JD had more than 120,000 regular employees and is one of the largest online markets for mobile phones, digital technologies and computer retailers in China. The company’s catalog covers categories including household, computing, toys, menswear, womenswear, shoes, books, gifts, sports equipment, and auto accessories. In May 2014, Jingdong successfully listed on NASDAQ in the United States. 1 Building Large-Scale Image Feature Extraction with BigDL at JD.com, https://software.intel.com/en-us/articles/building-large-scale-imagefeature-extraction-with-bigdl-at-jdcom. Intel technologies’ features and benefits depend on system configuration and may require enabled hardware, software, or service activation. Performance varies depending on system configuration. No computer system can be absolutely secure. Check with your system manufacturer or retailer, or learn more at https://software.intel.com/en-us/articles/bigdl-distributed-deep-learning-on-apache-spark. The performance test in this paper compares 20 NVIDIA Tesla* K40 with 24 servers based on the Intel® Xeon® processor E5-2650 v4 at 2.20GHz with 1200 logical cores. Each server has 24 physical cores with Intel® Hyper-Threading Technology (Intel® HT Technology) enabled, and is configured to support 50 logical cores in Apache Hadoop Yet Another Resource Negotiator* (YARN*).